This level meter detects the level of the substance without being affected by changes in the surrounding such as: high temperatures, high pressures, steam, gases, or changes in the characteristics of liquid. No moving parts and maintenance free. Intrinsically safe explosion-proof construction (ATEX) is also available. The display section can be separated and mounted on another unit. Is approved for CE marking. 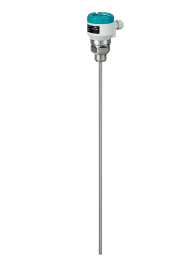 This level meter detects the level of a substance without being affected by changes in the surroundings such as: high temperatures, high pressures, steam, gases, or changes in the characteristics of the liquid. It can measure levels at depths up to10m. (For depths greater than 10m, please contact us.) A high temperature model is also available. This series is also approved for CE marking. Ex. : Monitor city water level, sewage, drain liquid, chemical agents (acids, alkalies), slurries, storage tanks, silos, etc. *1: When the meter is installed properly and it is making measurements in tap water. The measured result may be outside of the specified range depending on the conditions and object being measured. *2: For depths greater than 10m, contact us. *3: Can be changed to SUS316L. Signal input voltage (terminals 5 and 6).